Clothes for fashion dolls can be expensive, but they don't have to be when you sew them yourself! These 10 free patterns are the perfect place to start as you make dresses, tops, pants, and even a fully-detailed trench coat. Within these links, you'll find tutorials for Barbie (in her various sizes and styles), her friends, plus Bratz, Monster High, and more. Sewing these small items can take a bit of patience, but it's a great way to turn fabric scraps into something special. And once you try these patterns, you'll also find more tutorials through the different sites for making other clothing pieces and accessories. Within no time, your fashion dolls can host a full fashion show! Pixie Faire designs and sells patterns for doll clothes of almost any size, including Barbie and Monster High. This basic tee is one one of their free patterns, and it certainly a useful one! Make a few and let your child decorate them with fabric paints or other decorations. Head to YouTube to watch how My Froggy Stuff makes gorgeous dresses... without a pattern! She walks you through the process, then shows how to adapt the dresses into other styles. Once you learn this technique, the possibilities are endless! Be sure to check out the many other video tutorials from My Froggy Stuff, including how to make miniature furniture, accessories, and more. There's great style in this set of shirt and trousers for Tall Barbie, but it's just the beginning of the printable patterns from Chellywood. 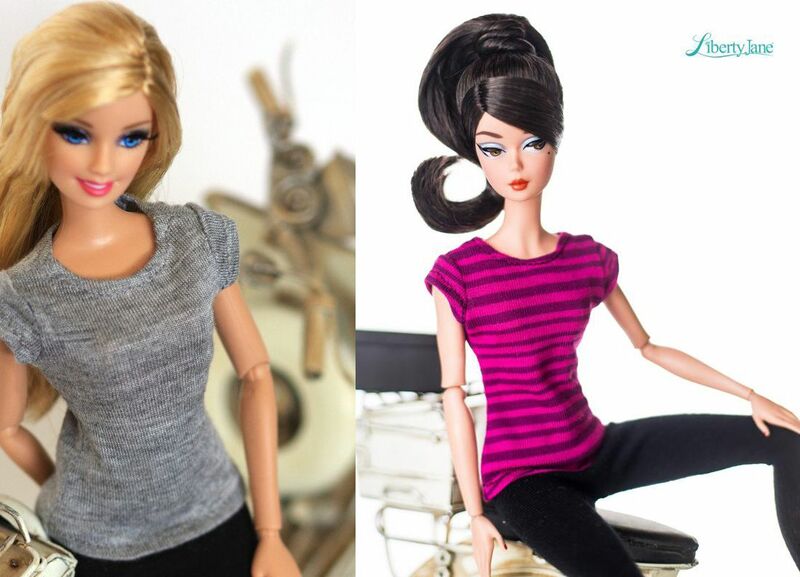 She has designs ​available for all sizes of Barbies, plus other fashion dolls. And most come with free video tutorials too! This adaptation of a basic strapless dress has the added element of a peplum or attached apron. Using eyelet trim makes it easy, and it's so cute too! Need a break from fiddly tiny sewing? Try these three no-sew swimsuit ideas! And if you want to make something that lasts a little longer, use these as a springboard to sew similar swimwear for your dolls. Sew up a ruffly apron and add style to any doll's simple outfit! By adding trim to the edge of this half-circle apron, you get a unique look and one that you can change up with different materials. Plus, it has the look of a full skirt without any special fasteners. 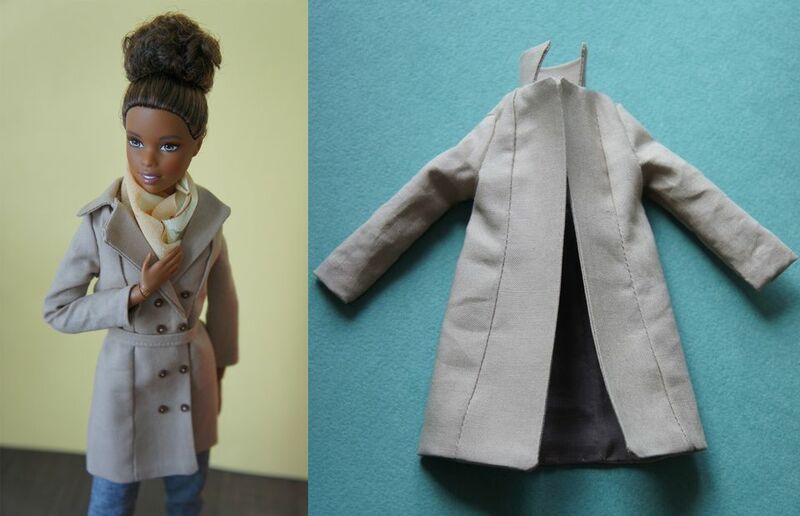 When you're ready to make something special for your fashion doll, look no further than this short, double-breasted trench coat. Visit For Dolls With Love for the tutorial, as well as a glimpse at how this coat looks in stripes and a hooded raincoat pattern too! The simplicity of this dress makes it easy for kids to get their dolls all dressed. Just attach it in the back with hook and loop tape! If you're feeling adventurous, adapt the pattern by giving it a fuller skirt. This tutorial doesn't include a pattern, but that's because it shows you how to make your own for any size doll. The process looks long, but once you have the pattern drafted, you can make lots of shirts in different styles!